How can a non-empath live with an empathic spouse? What a loving question! Yes a non-empath can live with an empathic spouse. In The Empath’s Survival Guide I discuss what the signs are of a relationship empath. Most important you need to give your spouse the alone time he/she needs, have discussions about how long he/she feels comfortable staying in social situations (empaths get burned out and overstimulated with too much people-contact), and encourage your spouse to set limits with you or others if he/she needs to be quiet and alone. Also spend a lot of time in nature. Empaths love nature! The right love relationship empowers empaths. Being valued and adored makes us more grounded. When empaths have an emotionally available partner who honors their sensitivities, they feel secure and supported. 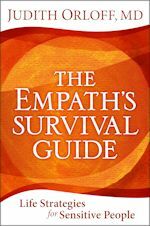 To learn more of the common challenges and adjustments necessary to create successful relationships with an empath read my article 10 Secrets to Loving an Empath and to learn more strategies on how to live with an empath read The Empath’s Survival Guide. You can also check out the Empath Support Page on my website.